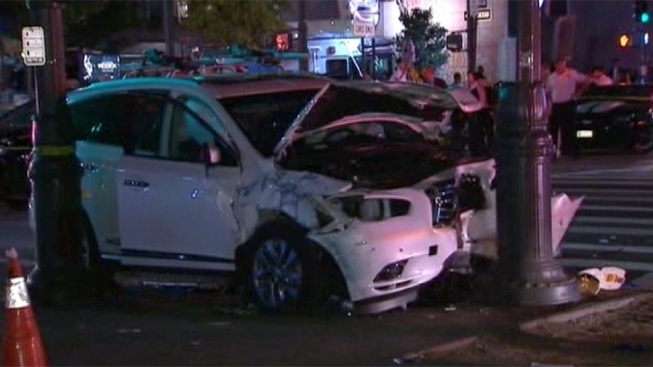 A woman's leg was nearly severed and six other people were hurt when an SUV jumped a curb in Brooklyn Thursday evening and crashed into several pedestrians, authorities say. Police said a black Hyundai heading east on Eastern Parkway was making a left onto Kingston Avenue in Crown Heights at about 7 p.m. when it collided with a white Infiniti SUV, sending it onto the sidewalk. "I heard this loud boom, it sounded like an airplane hit," said witness Simone Alleyne. One woman had a severe leg injury, according to police; a law enforcement official and witnesses said it was nearly severed. Another woman is in critical condition with serious head injuries, and three others were also seriously hurt. The driver and a passenger had minor injuries, and two other people refused medical treatment at the scene. Two of the injured pedestrians were visiting from Israel in celebration of Rosh Hashana, according to law enforcement sources. The crash remains under investigation, but some neighbors blamed a change in traffic flow. "For whatever reason, they changed the traffic pattern, whether it was make turning lanes or whatever. Cars are hitting each other," said neighbor Ken Dawson. A British tourist lost her leg last month when a taxicab slammed into her on a busy sidewalk in midtown. The driver, who had his license suspended for a month, said he was startled into slamming on the gas pedal when an aggressive bicyclist tried to cut him off.